I've written this report on agave with the intention to provide clarity around an area of controversy, and to share the integrity of Gnosis' choices. As a Health Counselor, I've chosen each ingredient in our chocolates for their health-promoting, healing properties. I am continually amazed that chocolate comprised of ingredients chosen for nutrition - not for flavor - can taste so good! I wouldn't be making chocolate if I didn't believe with all my heart that the products we make are helping people make profound changes in their diets and therefore in their quality of life. One of the components of our bars, Agave Nectar, came under scrutiny a few months ago and what was said about this sweetener was shocking to many. More than researching reports and reading third party blogs, I felt the only way to respond to these concerns and continue to use agave nectar with integrity was to visit my source in Mexico. 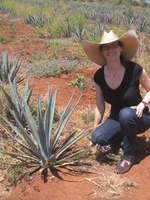 Below is an article about my Adventure with Agave and all I have learned about this sweetener. As a holistic health counselor, I started making chocolate as a tool for my clients to help them break their struggles with weight, sugar addiction, and imbalanced diet. I certainly did not have any intention to start a chocolate company, nor had I taken any classes on chocolate making. I knew that Agave Nectar was a low glycemic sweetener unlike the chemically produced artificial sugar substitutes like Splenda or Sweet 'N Low in that it was extracted from the Agave Cactus and was available as a raw, organic, close-to-nature low glycemic alternative. Honey is not low glycemic, vegan, or sustainable to use when you're making as much chocolate as we do (from what I've learned about the honey industry - local honey is sustainable but large amounts of organic honey is imported to supply the industry). So when it came to choosing what sweetener to use in my chocolate, there was no question about it! The chocolate bars served as a wonderful replacement for my clients' unhealthy foods - it enabled them to actually enjoy a diet free of refined sugar and junk foods. The enjoyment of a healthy diet proves in every way to multiply the benefits of every effort they made and it was clear that the chocolate was a huge help to them! Then a few months ago, an article was written by Dr. Mercola stating that all health claims made about agave were untrue. He not only said that it was dangerous to our health, but claimed that agave is worse than high fructose corn syrup! Dr. Mercola stated that fructose is "evil" and because agave contains a lot of fructose, that it is a "fraud deception. "* Of course, the response to his statement was intense. Blogs started spreading his report like wildfire. I immediately called my source for agave and we discussed the statements being made. I was invited to visit the farms and facilities personally, and I quickly made arrangements to head to Guadalajara, Mexico to get to the heart of the matter. Over the course of my visit, it was clear that the IMAG employees in the office were passionate about the effect that growth in the agave nectar industry has on the farmers. Tequila was the only product created from the agave plant for quite some time, so there was much unused land and agave that went to waste. IMAG's new farms gave employment to hundreds of families and the farmers can take part in profit sharing - something I hope to soon implement with Team Gnosis! We went to visit several farms in the Jalisco region, where I observed the plants in various stages of growth, being harvested by hand. I even harvested one myself! It's hard work under very hot sun. The agave are cut out of the ground with a shovel type instrument, whose sharp edge is then used to trim the large leaves from around the heart of the plant (this is known as the pina). The pina is what is then used to extract agave nectar or, as it is known in Mexico, Miel de Agave, "honey of agave." We cut open a fresh pina, and I was surprised not to see any liquid. Instead, I would describe the consistency of the pina to be a cross between a sweet potato and cane sugar (if you have ever had fresh cane, I'm referring to the hard fibers dripping with juice). I ate a piece and it was subtly sweet, but was cautioned that eating too much raw pina could cause diarrhea. I learned this was because inulin, the fiber which gets broken down during extraction, is a prebiotic laxative that is actually used as such in health supplements. On the farms, I observed weeds around the cacti which is a sign of organic farming as any herbicides would leave no possibility for their growth. I also observed several plots of land "resting" in between plantings to ensure the soil remained fertile. After visiting many farms, we went to the facility where the agave pinas are crushed and the nectar is filtered, evaporated, and bottled. The IMAG team spent all day with me explaining every step of the process, and went into depth on every element I had questions about. Even at the end of the day when they had finished crushing the pinas and cleaned up, I wanted to revisit the crushing step and they restarted the machine. They had a true desire for me to see and understand everything I needed to write a full and accurate report. The first thing that was easy to see was that the factory was utterly spotless. Incredibly sanitary, and very well staffed, I found no leaks or chemical odors. 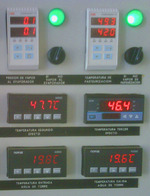 There were several operators monitoring the process and temperature guages. Here is the process from start to finish, all which can be done under 118 degrees. 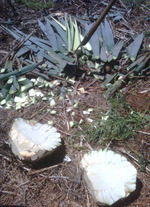 First, the harvested pinas (agave cacti with leaves trimmed) are shredded into a fine pulp. This pulp is then flushed with warm water and pressed to separate the juice and fiber. The extra fiber is composted! They had just begun a batch of their raw agave, and there are temperature gauges along the crushing and filtering process which I saw were under 118 degrees. I touched the agave fibre as it came out of each stage by hand and it was only warm to the touch. The color of the liquid was a light yellow color and got darker as the fibre was pressed and some natural oxidization (like in bananas) occurred. This step of the process took under 15 minutes. Then, the juice is poured into a tank where a heating coil spirals up through the juice to warm the agave. The coil structure is to allow more surface area to touch the juice which is important, especially at low temperatures. If they just had the bottom or sides of the tank heated, the agave at the center would rely solely on convection to move the cooler agave to the heat coming from the walls. The coil allows low temperature to go further. In warming the agave, the inulin (aforementioned prebiotic fiber) breaks down into its simpler sugar molecules - fructose. This process is called "hydrolysis" and I can see why, unless you actually understand how hydrolysis takes place, it can sound like a highly complicated processing technique. It just means warming the agave. I would liken it to a dehydration process in raw bread or crackers, which can take over a day. Hydrolysis is also an essential part of energy storage and metabolism in plants and animals as adenosine triphosphate (ATP) is processed. Hydrolysis also occurs when fats, proteins, and carbohydrates are broken down by enzymes in the body - for example, when proteases aid in digestion by causing hydrolysis in the peptide bonds of protein. Just as with most processes in food, hydrolysis in agave happens more slowly at lower temperatures. In raw agave, the process takes about 34 hours. In cooked agave it takes only 8 hours. Unfortunately, the agave in the tank at the time I visited was not made for raw production. IMAG also makes a line of cooked agave and they had the raw agave in the crushing/filtering stage and in the final evaporation stage, but were filling the hydrolysis tank which would be full the next day. This is the one part of my visit I am not satisfied with - better planning would have allowed me to witness the entire production done in the raw method, and I certainly would have stayed for an extra day had I known their production schedule in advance. But I did see the other stages of raw processing done specifically under 118 degrees, I saw temperature gauges and monitoring, and after getting to know the IMAG team, I do have trust in their integrity and in their word. When it comes down to monitoring the "rawness" of a product as I explain further in my Raw Integrity Project, it comes down to trust. As long as there is not a raw certifier who can inspect a printed record of temperatures throughout all processing - just as with certified organic products and their rigorous auditing process - there must be trust amongst manufacturers. This is why I am so happy that I visited and got to know the intentions and motivations of the IMAG team. I cannot speak for all agave manufacturers, but I do trust IMAG enough to believe that the hydrolysis does not exceed 118 degrees. IMAG is also inspected by two outside auditors. I met one of the inspectors and he confirmed my questions and, though he was not specifically there to audit the raw food matter, he did confirm that there were two processes and one was always maintained under 118 degrees. Either I will return or one of my colleagues will visit with a temperature gun to verify in person that this is all done with Raw Integrity. The last step of the process takes only about ten seconds as the juice goes through a vacuum pressure tunnel and the water is evaporated out of the juice. 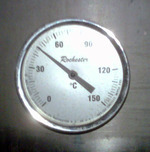 The temperature gauges all read exactly at or slightly under 118 degrees. Because the evaporation occurs within a vacuum, it is possible to extract all the water without needing to boil the juice. The water is then recycled - it goes back to the shredding and filtering stage. We visited where the agave is bottled and stored, and then we went to their laboratory where they perform all analysis of their final product in house. This is extremely rare - normally a third party is used - I was told the testing equipment was brand new and I can only imagine extremely expensive. We analyzed light, amber and dark agaves to see their breakdowns. If you are interested in viewing these, please don't hesitate to let me know! There is very little difference between the colors. This confused me, so we went back to the office to go over the details of color. Before my visit, I was convinced that the color of agave indicated something about the processing temperatures. I had conversations with several others in the industry about this and the general consensus was that if the fresh agave cactus juice was clear or amber when extracted from the pina before processing, it should remain clear or amber through processing. It made sense to me that in heating the agave, it would become darker as with the caramelization of sugar. But because no one had ever seen a fresh pina, it remained unclear which color to look for. The IMAG team confirmed that heat does have an effect on the agave - heating the agave for longer periods of time and/or at higher temperatures can lead to a dark agave. But (and this involved some drawing of diagrams) all colors of agave - clear, light, amber, and dark agaves can ALL be produced at any temperature because filtration also has a major influence on color. Larger particles that can pass through a coarser filter result in darker agave whereas smaller particles that can pass through a fine filter result in a lighter color agave. If the mesh is extremely fine, a clearer agave can be made. However, they explained that the clear agave usually requires an enzyme because even a very low temperature hydrolysis will darken the color slightly. Perhaps the agave can be clear directly after filtering, but if the juice is not hydrolyzed enough, too much water and too much inulin will remain in the final product which would render it useless. IMAG does not produce clear agave now because they do not use any added enzymes or chemicals in their process. So now to address the questions and concerns raised by Dr. Mercola. Please keep in mind that I have learned a lot over the years from Dr. Mercola and respect his work. I am only breaking down these statements to respond directly to the concerns that have been raised by our customers who read his newsletter which went out to over a million readers. Having actually witnessed the process he speaks of, I feel I might provide some helpful insight. Again, please also keep in mind that I cannot speak for all makers of agave, but I am confident in my specific source. 1. "Most agave "nectar" or agave "syrup" is nothing more than a laboratory-generated super-condensed fructose syrup"** Making nectar out of a pina is not something we could do in our teeny tiny NYC chocolate kitchen, but the process isn't so complicated! I think it could certainly be done if you had fresh pinas, something to crush and grind it, and a way to heat the juice to evaporate out the water without boiling (like a pot over very, very low heat). If you used a closed dehydrator without a vacuum, then the hydrolysis would occur, but a lot of water would remain in the juice. This may be fine for use in most recipes, but that water in chocolate can ruin your recipe! So I believe the vacuum evaporation is an essential part of making a successful agave nectar... but it is certainly not just a laboratory-generated product! 2. "'The process which many, if not most, agave producers use to convert this inulin into "nectar" is VERY similar to the process by which cornstarch is converted into HFCS1. "** From what I have understood, the processing of High Fructose Corn Syrup involves the following, which are not part of agave processing: enzyme conversion with alpha-amylase, glucoamylase, and xylose isomerase, centrifuges, hydrochloric acid, deionization, and larger issues including GMO and Government Subsidization. Although I haven't visited a HFCS facility, my visit to Jalisco and my studies are enough to convince me that the two processes are very, very different! 3. "Here is a partial list of the chemicals many producers use: Activated charcoal, Cationic and ionic resins, Sulfuric and/or hydrofluoric acid, Dicalite, Clarimex, Inulin enzymes, Fructozyme. "** IMAG uses not a single one of the above, or any other, chemicals in their processing. I believe it's so important to keep in mind that fructose is the sugar in fruit! It seems that somehow, fructose has been conveyed as an evil element in our diet. We cannot begin to see such a vital part of life as evil! If this were true, our biological instinct would not be to consume fruit. The rich vibrant colors, succulent aromas, and delicious flavors of fruits would not be attractive to our ancestors in the wild... we are not interested in consuming branches of trees like many insects are! In our products, you consume a small amount of agave mixed with the fiber, antioxidants, minerals, and vitamins of cacao beans, fruits, nuts, and the medicinal herbs and superfoods. It's not as though you are eating an apple's worth of agave (if you are, maybe you'd like to consider refining your palette to enjoy a full range of flavors including bitter greens!). Perhaps if you consume a whole bar of chocolate, several other raw desserts with agave, a bunch of bananas, and put several teaspoons of agave in your tea, you might be overdoing it! Although I do not believe that "everything in moderation" is an accurate statement (you don't want ANY drugs in your system, for example! ), putting such a short limit to how much fruit we can eat because it has fructose in it is absurd. I will continue to play with the healthiest superfoods and sweeteners available on the market. This is my mission and I follow it with all my heart with the goal to provide you with a product that energizes you and allows for improvement in your diet and overall well being. There is no better sweetener on the market that works with chocolate, though Balinese Palm Nectar is proving to be more and more exciting! Not only does it taste incredibly delicious with notes of caramel and maple, but it is highly nutritious and harvested by friends of mine in an ultra sustainable, socially responsible manner. It has been officially declared to be the world's most sustainable sweetener by the FAO! Our Sugarplum Gingerbread and OrigiNib Collection Bars are sweetened with Balinese Palm Nectar. We will be launching more products with alternative sweeteners. To learn about these launches first, sign up for our ChocoLetter! We are also more than happy to create Custom Chocolates with any sweetener you would like (stevia, yacon, erythritrol, xylitol, etc). As a final word, I would like to mention the importance of doing background research. Although the internet allows us access to much wonderful information, there are many fictitious claims for which the internet unfortunately paves the way into our minds. One alarmist article on agave written (by someone who has never visited an agave facility and who sells meat, dairy, and chocolate sweetened with tapioca syrup as the first ingredient AND SUGAR AND DEXTROSE on his website) resulted in millions of people shying away from a wonderful product. Not that everyone can visit agave farms or cacao farms, but please do check sources who do! There are many, and I've posted links to their reviews below. The sap of agaves has long been used in Central America as a binding agent for various powders used as poultices on wounds. The sap can also be taken internally in the treatment of diarrhoea, dysentery etc. The sap is antiseptic, diaphoretic, diuretic and laxative. An infusion of the chopped leaf is purgative and the juice of the leaves is applied to bruises. The plant is used internally in the treatment of indigestion, flatulence, constipation, jaundice and dysentery. The sap has disinfectant properties and can be taken internally to check the growth of putrefactive bacteria in the stomach and intestines. Water in which agave fibre has been soaked for a day can be used as a scalp disinfectant and tonic in cases of falling hair. Steroid drug precursors are obtained from the leaves. A gum from the root and leaf is used in the treatment of toothache. The root is diaphoretic and diuretic. It is used in the treatment of syphilis. All parts of the plant can be harvested for use as required, they can also be dried for later use. The dried leaves and roots store well. The FDA has not approved these statements. This report is not intended to diagnose, treat, or cure any disease. I'm not a doctor, but I do care about your health, feedback, experiences, and questions. Please email vanessa@gnosischocolate.com or call (877) 4 GNOSIS / (646) 688 - 5549.